If you're only using cucumbers to add a refreshing crunch to sandwiches and salads, you're missing a trick – there's so much more these delicious sticks can be used for. Check out how the UK's top chefs utilise the green, vibrant flavour of British-grown cucumbers in their dishes and recreate them at home. It’s great that cucumbers can simply be sliced up and ready to eat in a matter of seconds, but have you ever thought about what they’d be like cooked? While their high water content means the vegetable isn’t really suited to being baked or slow-roasted, there are plenty of other cooking techniques that bring out its flavour – especially when paired with fish. Braising cucumbers, as the blogger Food Urchin does in his dish of Braised fennel and cucumber with sourdough crumbs, smoked pancetta and baked cod loin, means they keep their bite and fresh, leafy taste whilst simultaneously taking on the flavours of lemon and garlic perfectly. Chef Pete Biggs takes a gentler approach, making a cucumber and horseradish stock for his Turbot with oysters, cabbage and bacon, which he then gently heats with an oyster mayonnaise to make a rich, flavourful sauce. Turbot seems to be a popular partner; Dominic Chapman pan-fries the luxurious fish and serves it with an innovative cucumber beurre blanc, contrasting fresh and rich flavours with finesse. Steven Smith, on the other hand, boils cucumber and apple juice before adding agar agar and xanthan gum to make a smooth bed of sauce for his Mackerel and horseradish snow. Cucumbers are quintessentially British – after all, how could we make our iconic cucumber sandwiches without them? – but their refreshing flavour works incredibly well with vibrant Asian cuisine, particularly southeast Asian. A relatively quick pickle makes the vegetable a perfect side to sesame salmon and sticky coconut rice, as shown by blogger Georgina Fuggle, while chef Paul Welburn makes a very cheffy cucumber ketchup out of juice, Chadonnay vinegar and shallots for his Lemongrass-smoked cod, mussels and sea vegetables dish. Food Urchin once again uses heat to bring out the flavour of cucumber in his Vietnamese seafood and cucumber stir-fry, quickly frying batons in a fragrant mixture of shrimp paste, chilli, garlic and spring onion. 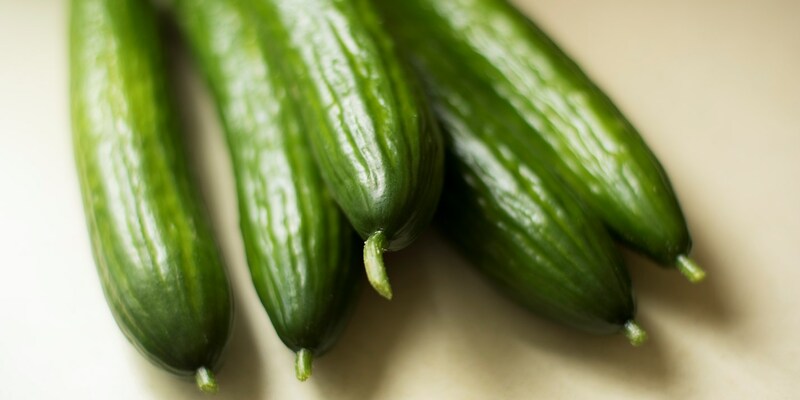 We pop a slice in our gin and tonic and chop up a whole stick for Pimm’s, so it’s no wonder chefs are using cucumbers in sweet dishes. When pickled, it can add an interesting savoury note, as in Agnar Sverrisson’s White chocolate mousse and sorbet with dill and cucumber – the sharp cubes of cucumber contrast perfectly with the smooth, sweet white chocolate. The vegetable also pairs particularly well with strawberries; try Food Urchin’s Cucumber panna cotta with strawberries, lemon thyme and honeycomb for a dish that really encapsulates the British summer. A high water content makes cucumber the perfect candidate for turning into a sorbet in both a sweet and savoury context. As a dessert, make the sorbet the main event – transform Pimm’s from a summer drink to a show-stopping dessert with chef Josh Eggleton’s iconic Pimm’s jelly with cucumber sorbet. For something savoury, Russell Bateman brings the wow factor with his Cucumber and yoghurt sorbet with citrus-cured salmon, charred cucumber and pickled cucumber, making the most of the vegetable’s versatility. For something entirely different, try Italian chef Andrea Berton’s mind-bending dish of Grilled watermelon, aubergine, chocolate crumbs, cucumber and ginger sorbet – a sweet-meets-savoury dessert which makes the most of cucumber’s refreshing, clean flavour. Blending or juicing a cucumber leaves you with a fragrant, fresh liquid that’s ideal for adding to soups – especially iced ones for the summer months. Marcus Wareing’s White gazpacho is a nutty, garlicky, yoghurt-based shot of flavour which relies on blitzed cucumbers to lighten the taste. Matthew Tomkinson follows suit, combining horseradish, herbs, cucumber and mascarpone to make a cold soup to serve with his crab salad. For an even simpler, dish, Andy Waters simply blends cucumbers with mint, coriander, sherry vinegar and Tabasco to serve with crumbled feta cheese in his easy summer recipe.